There is a dirty secret within tourism and it's a secret shared by most tour guides and locals. We don’t like tourists! Sounds strange, our economies depend on tourism and our jobs definitely depend on tourists, but let me explain. Think of your home city wherever it is, New York, California, London, Sydney and think of all the places you avoid just because of the tourists. Done it? Well, we feel exactly the same. Let's get one thing straight; it's not all tourists it's just ones that do incredible stupid or obnoxious things without even thinking about their surroundings. O Imparcial, 25th August 1901. It is fair to say that the opening of the first tram in Lisbon was not (at least at first) a popular move. Fear of the new technology and the risk to life it could cause meant that few people could be found who were not fearful that a thunderstorm could end up sending lightning bolts through every window in the city. Today though they are a much-loved icon. Providing small electrical trams that can twist and turn up the steepest and sharpest of hills. They go where the metro and modern articulated trams dare not tread. The problem is for many residents of Alfama, Graça and so on they are the only form of public transport accessible to them. The number 28 is one such tram, and its popularity amongst tourists is a real headache for the locals. The trams have a seating capacity of 20 and a standing capacity of around another 30, they arrive every ten minutes and in the summer the square of Martim Moniz will have lines of up to 2 hours long with tourists waiting to take the 28’s iconic winding route. You can buy tickets directly on the tram, but this costs you more and holds up the line. Instead, buy a daily travel pass for €6.90 when you arrive in Lisbon. These can be purchased at any Metro station in the city and are valid on all Metro, buses, trams, and ferries (find out more here). Alternatively, there is the Zapping option, the Zapping cards can be bought at all metro stops and a few other places around the city for just 50 cents and can then be topped up with anything from €3 to €40 depending on the length of your stay. Each time you get on a tram or a bus simply look for the yellow box and tap your card against it, your balance will come up at this point, so if it is running low you can easily top it up again at any metro before getting caught short. We get it your on holiday and you want to see as much as possible, but people need to get to work, so let them. Lisbon’s a slow city, take an extra coffee and pastel de nata and relax. Try not to use the trams between the hours of 8 am and 10 am and then from 5 pm till 7 pm. This way you will help ease congestion on a very old transport system. The 28 is standing room only from 8 am till 7 pm, so if you really must ride the 28 then take it in the late evening, it will be cooler and less crowded. We know that Rick Steeves says it's a must do and so Fodors, TimeOut and every other guide book under the sun, but there are currently 5 tram routes that use the beautiful old yellow trolley and some of their routes lead to beautiful neighborhoods often ignored by the hordes heading to Alfama and Castelo. Also, the 28 is a pickpockets dream so do be careful of your belongings. We particularly like the tram 25 and 18 which travel through fascinating areas like Estrela and Ajuda where you can visit the criminally under-visited royal palaces. 4. Don't ride the tram! Do you really want to spend 3 hours of your holiday in the baking sun, followed by an hour crammed like sardines into an unairconditioned sweatbox? There's a much better option. Take a walking tour!! Our Alfama tour covers a huge section of the Tram 28's route, you'll learn more and you'll burn off some calories leaving more space for Ginjinha and a pastel de nata, and the one thing you will notice about our photos of the trams is we are never on them, Simple! 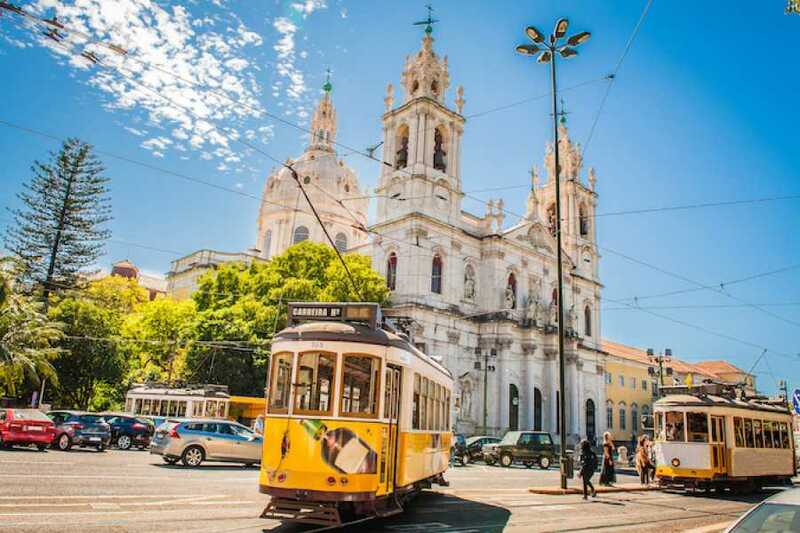 All in all the trams of Lisbon are a must do, but be sensitive of the locals and use them at sensible times of day and take the stress off the 28.